A registered nutritional therapist and wellbeing coach, I set up Gut Reaction in 2013 to pursue my passion to help people to both enjoy and reap the benefits of a nourishing diet and lifestyle. I’m passionate about inspiring, informing and engaging people in the process of enhancing their mind-body health through personalised nutrition and lifestyle medicine, as well as helping them build nourishing sustainable new habits that they love. Discovering the power of nutrition on my own health has played a huge role in shaping my life both personally and professionally. And having experienced and overcome my own challenges is why I work from a place of real compassion and an appreciation of how unique we all are when I’m working with others. Looking back now, I can clearly see how the impact of my poor childhood food choices played out into my relationship with food in my teens and early 20s when, for a number of years, it felt like I was ‘fire-fighting’ bloating and putting up with a general ‘fogginess’ which detracted from some of my enjoyment at work and play. I was really disconnected with what to eat to make my body feel good and it felt like everything I ate left me bloated and on edge. Then, when a stressful job coincided with a series of close family bereavements in my mid-20s, I felt things taking a toll on my health. Thankfully, a few conversations sparked a visit to a nutritional therapist and I soon realised the impact that making different food choices could have on my everyday wellbeing and personal resilience. The symptoms I experienced that drove me to seek support were synonymous with Irritable Bowel Syndrome and adrenal exhaustion. Eager for a deeper understanding of gut health particularly, I took to studying a Diploma in Nutritional Therapy alongside my old career job. And, with my new-found knowledge, I radically but gradually changed my eating habits and watched my health elevate! I effectively transformed a diet dominated by ‘beige foods’ into one rich in a spectrum of plant-based foods with all the nutrients and fibre that they bring. I embraced more protein-rich foods by expanding my mainly vegetarian and carb heavy repertoire to incorporate fish and high quality lean meats. And I radically reduced identified sugar sources and other inflammatory triggers, and quit my grazing habit. I tried for myself the clinical tests that I recommend to others, learned a whole lot about my body and what works for me, addressed food sensitivities, utilised some incredible natural supplements therapeutically, and integrated into my daily diet an array of 'functional foods' to support my gut, such as fermented foods which I have learnt to love and now wouldn't be without. Now, I really do love food - I eat a varied, colourful diet and use my nutritional wisdom to make good choices and eat intuitively, and without fear! Today, at 38, I am more energised and stronger in my mind. body and gut than I have ever been. And I enjoy helping people learn nourishing habits to help them feel body confident, energised, glowing and manage a healthy weight. Finding and maintaining good health, overall wellbeing and positive energy, naturally extends beyond nutrition alone - it’s about your lifestyle. I highly value a range of practices and activities in my own life including yoga, dance classes, spending quality time with my boyfriend, family and friends, walking with my local Walk ‘n Talk Wellbeing group, travel and experiencing different cultures, swimming in the sea, chilling with my cat Bruno, looking at art and having artistic outlets - and basically making space for all the things that make me feel good! I set-up Gut Reaction as I was compelled to share what I’ve learned and provide other people with the guidance and support they need to improve their own health and wellbeing. Since achieving my Diploma in Nutritional Therapy, I have undertaken further training specialising in weight issues, and have studied with the National Centre for Eating Disorders, completing a course in Psychological Approaches to Obesity. 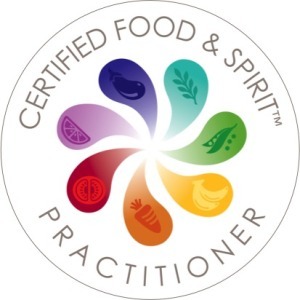 I am currently studying under the wing of Dr Deanna Minich, training to become a certified Food & Spirit practitioner in early 2019, to add further dimensions to my wellbeing coaching.